The 4 essential products for perfect skin. - Wash your face, body and hair with the 3-in-1 Cleansing Gel. - For an even softer and deeply purified skin, use daily the Alpha-Hydroxy-Acids Facial Cleanser. Apply the Alpha-Hydroxy-Acids Facial Cleanser to damp skin, rub and leave the product on for one minute and rinse. - Apply the Anti-Aging and Moisturizing Face Cream morning and night for deeply nourished skin. - Apply the 3-in-1 Eye Serum every day, morning and night, for an immediate revitalizing effect. A real “urban shield” rich in antioxidants, trace elements and minerals. It ensures biological protection against reactive oxygen and the harmful effects caused by environmental factors (pollution, UV rays, harsh weather conditions, cigarette smoke). It maintains levels of collagen and elastin in the skin, stimulates the regenerative capacity of the skin, helping to keep it soft and supple. It acts as a genuine “Hydration Reservoir”. Naturally present in the skin, it is a major active cosmetic both hydrating and plumping by forming a film on the skin’s surface which, like a little cushion, maintains the hydration of the skin. A concentrate of the African flower Spilanthes acmellia which targets saggy areas and deep wrinkles. It smooths the surface of the skin and reinforces the epidermis. A powerful antioxidant which makes the skin more supple, reduces roughness, protects the cells against free radicals and increases the elasticity and softness of the skin. These oils nourish and protect the skin by rebuilding the lipid film. Thanks to their softening, toning and regenerating properties they restore the skin’s elasticity and radiance while preserving the skin tissue from premature ageing. An oil with antioxidant properties which maintains and protects the skin’s protective barrier. It gives the skin a feeling of comfort, suppleness and hydration. Sea buckthorn is rich in vitamin C, phytosterols and flavonoids which make you look good immediately. A powerful active cosmetic with soothing and healing properties. This multi-beneficial ingredient smooths the skin, restores its natural defences, improves elasticity, regulates dryness, protects it from harmful outside stimuli, softens and repairs the epidermis. Perfume developed in strict collaboration with ‘a nose’ in the region of Grasse, world capital of perfume. Its woody notes bring a subtle touch of freshness and elegance to your care routine. Exclusive complex of probiotics, green tea, pomegranate and caffeine. Probiotics reduce hyperpigmentation leading to a reduction in dark shadows under the eyes. Green tea helps to protect the area around the eyes against environmental damage while reducing the appearance of dark circles. The carbohydrates in pomegranates have an immediate lifting effect and help to reduce puffiness and wrinkles. Caffeine is an excellent vascular toner which acts on the vessels to reduce unsightly bags. What’s more, it has excellent antioxidant properties which protect you from the effects of UV rays and slow down the skin’s ageing process. Blueberry extract, hyaluronic acid, trace elements: magnesium, zinc, vitamins E, B5 and PP, active ingredient: liquorice extract. The blueberry is known for its calming and soothing action on tired eyes; hyaluronic acid for its super hydrating power, trace elements and vitamins for their antioxidant properties which help the skin to repair and regenerate. And finally, liquorice extract protects the skin from harmful outside stimuli. Polysaccharides, rich in sugar, are famous for their hydrating, soothing ant-inflammatory properties, as well as their tightening effect on the skin.They comfort, soften and calm the skin. This natural blend of five botanical extracts contains several fruit acids (AHA) which encourage the renewal of cells and leave your skin feeling smoother and younger. The combined action of these 5 AHAs make for a unique cocktail with multiple benefits. Lactic acid is a very efficient moisturizer, glycolic acid efficiently sheds the dead cells on the skin’s surface, citric acid stimulates the synthesis of collagen while tartaric acid and malic acid strengthen the elasticity of the skin. An ingredient with a gentle cleansing property which is suitable for all skin types, even the most sensitive ones, complemented by a “refatting” action which restores the skin’s hydrolipidic film. Aqua/Water/Eau, Caprylic/Capric Triglyceride, Dicaprylyl Ether, Cetyl Alcohol, Glycerin, Cetearyl Alcohol, Nylon 6/12, Prunus Amygdalus Dulcis (Sweet Almond) Oil, Polyglyceryl-6 Distearate, Undaria Pinnatifida Extract, Simmondsia Chinensis (Jojoba) Seed Oil, Parfum/Fragrance, Hydroxyethyl Acrylate/Sodium Acryloyldimethyl Taurate Copolymer, Jojoba Esters, Tocopheryl Acetate, Pentylene Glycol, Helianthus Annuus (Sunflower) Seed Oil, Chlorphenesin, Polyglyceryl-3 Beeswax, Caprylyl Glycol, Xanthan Gum, Decylene Glycol, Bisabolol, Spilanthes Acmella Flower Extract, Sorbitan Isostearate, Polysorbate 60, Citric Acid, Argania Spinosa Leaf Extract, Maltodextrin, Hippophae Rhamnoides Fruit Extract, Sodium Hyaluronate, Sodium Benzoate, Potassium Sorbate, Tocopherol, Linalool, Benzyl Salicylate, Eugenol, Limonene. Aqua/Water/Eau, Glycerin, Sorbitan Palmitate, Isopropyl Palmitate, Caprylic/Capric Triglyceride, Centaurea Cyanus Flower Water, Undaria Pinnatifida Extract, Sclerotium Gum, Macadamia Integrifolia Seed Oil, Caffeine, Camellia Sinensis Leaf Extract, Punica Granatum Extract, Lactobacillus Ferment Lysate, Polyacrylate-13, Pentylene Glycol, Chlorphenesin, Polyisobutene, Caprylyl Glycol, Decylene Glycol, Glycyrrhetinic Acid, Lactobacillus Ferment, Niacinamide, Sodium Citrate, Magnesium Ascorbyl Phosphate, Biosaccharide Gum-1, Sodium Hyaluronate, Propylene Glycol, Panthenol, Tocopheryl Acetate, Polysorbate 20, Glyceryl Caprylate, Magnesium Gluconate, Citric Acid, Zinc Gluconate, Sodium Benzoate, Parfum/Fragrance, Sodium Hydroxide, Potassium Sorbate. Aqua/Water/Eau, Vaccinium Myrtillus Fruit Extract, Coco-Glucoside, Decyl Glucoside, Glycerin, Parfum/Fragrance, Polyacrylate Crosspolymer-6, Saccharum Officinarum (Sugarcane) Extract, Cocamidopropyl Betaine, Citrus Aurantium Dulcis (Orange) Fruit Extract, Citrus Limon (Lemon) Fruit Extract, Sodium Hydroxide, Sodium Benzoate, Acer Saccharum (Sugar Maple) Extract, Potassium Sorbate, Undaria Pinnatifida Extract, Trisodium Ethylenediamine Disuccinate. Aqua/Water/Eau, Glycerin, Coco-Glucoside, Decyl Glucoside, Parfum/Fragrance, Polyacrylate Crosspolymer-6, Cocamidopropyl Betaine, Polyquaternium-7, Sodium Benzoate, Propylene Glycol, Panthenol, Citric Acid, Potassium Sorbate, Undaria Pinnatifida Extract. 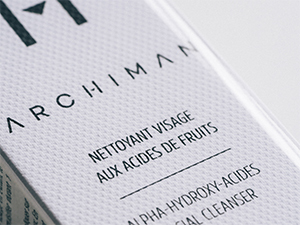 At Archiman we are committed to using only first-rate ingredients, with proven effectiveness, wholesome and respectful of human beings and their environment. Each ingredient is rigorously selected according to its effectiveness as well as its wholeness. We make sure that each one responds perfectly to our product specification and does not present any toxic risks which might irritate or sensitize your skin. If we are in the slightest doubt, we keep going with our research so we can offer you effective and innovative products. Our skincare routines are simple, efficient and addictive! And because your health and your skin are our priority we have set up our #Archiblacklist of ingredients which will never be used in our products. Parabens, Silicones, Phenoxyethanol, PEG’s, Phtalates, Parfum de synthèse, Huile minérale, Sulfate, Alkylphénol, Ammonium Lauryl Sulfate, BHA et BHT, Cixxxxx , DEA, Dioxyde de titane, Ethylhexyl Methoxycinnamate, Filtres solaires: benzophenone, 2-benzoyl-5-methoxyphenol ; 2-hydroxy-4-methoxybenzophenone ; (2-hydroxy-4-methoxyphenyl) phenylmethanone ; methanone, (2-hydroxy-4-methoxyphenyl) phenyl- ; (2-hydroxy-4-methoxyphenyl) phenyl-methanone ; oxybenzone ; oxybenzone 6; methanone, (2hydroxy4methoxyphenyl) phenyl ; b3 ; durascreen ; solaquin ; benzotriazolyl, Iodopropyl, Methylchloroisothiazolinone (MCIT), Methylisothiazolinone (MIT), P-Phenylenediamine, Perfluorés (PFOA, PFOS), Pétrolatum, Petroleum distillates, Siloxanes: Cyclopentasiloxane, Cyclomethicone, Cyclotetrasiloxane, Triclosan.